I'm Curious Too: How Does Hair Dye Work? 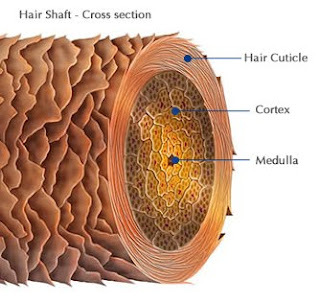 There are three layers that make up the hair: the core (also known as the medulla) is covered by a layer of cells called the cortex--this is where the pigmented melanin protein that gives hair its color can be found-and the outermost layer, called the cuticle. Hair dyes are categorized into three basic chemical formulations: temporary, semi-permanent and permanent. Temporary dye only covers the outermost later i.e. the cuticle, and so can be washed off immediately in soap water. Semi-permanent dye, on the other hand, contains molecules of pigment so tiny that they can penetrate the cuticle and stick to the cortex. However, due to the lack of chemical reaction between the dye and the hair, the process is still paint-like and the color can be washed off after several rounds of shampoo. Permanent dye, on the other hand, is designed to last until the hair falls out or cut. To achieve permanent alteration, the chemicals in the hair dye have to chemically react with the hair. Generally, permanent dye is made up of two main solutions: one containing an alkaline chemical plus two types of particles that will come together to form the new color: the dye precursor and dye couplers; and the other one containing the developer--an oxidizer, usually a weak hydrogen peroxide mixed properly right before applied to the hair. The alkaline solution opens up the cuticle so the dye could access the cortex. Next, the dark melanin in the cortex is broken down through oxidization by the developer, making the melanin colorless and releasing sulfur atoms into the air--which explains the characteristic stink of permanent dye. The developer also oxidizes the dye precursor, which is usually colorless, to form the new color. However, the new pigmented particle--called intermediate--could still slip back out the cuticle scales due to its minuscule size. To counter this problem, the dye couplers react with the intermediate to form larger polymers of pigment that are too large to slip out of the cuticle.